Fast drying. Will not break down. Perfect for ultrasonic cavitation. 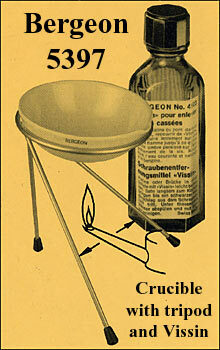 Can be used with all L&R Watch Cleaning Solutions. 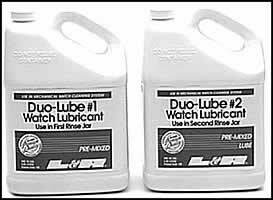 Ideal for use with all L&R Duo-Lube and Solo-Lube watch lubicants. L & R Ultrasonic Watch Rinsing Solution can now be shipped as a OMR-D item, it can only be shipped by UPS ground in the continuous 48 States. If you order this product, your order will be shipped by UPS ground service. Designed for ultrasonic cleaning. This product can now be shipped as a OMR-D item, it can only be shipped by UPS ground in the contiguous 48 States. If you order this product your order will be shipped by UPS ground service. Prevents varnish formation and gives the highest polish ever hoped for on watch parts. This product can now be shipped as a OMR-D item, it can only be shipped by UPS ground in the contiguous 48 States. If you order this product your order will be shipped by UPS ground service. Standard Rinse designed to be used in Non-Ultrasonic Machines and Ultrasonic Machines, can also be used to rinse clock parts. Clear petroleum distillate specially refined by L&R. 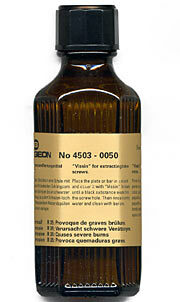 This product is respected and used the world over and contains no benzol or chlorinated solvents. Leaves no oily film. Quick drying. This product can now be shipped as a OMR-D item, it can only be shipped by UPS ground in the contiguous 48 States. If you order this product your order will be shipped by UPS ground service. Guaranteed maximum cleaning for ultrasonic, mechanical, or manual methods. Economical. One pint makes a gallon. Ammoniated water base is non-flammable. No cyanide. Completely safe. This product can now be shipped as a OMR-D item, it can only be shipped by UPS ground in the contiguous 48 States. If you order this product your order will be shipped by UPS ground service. 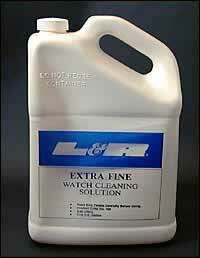 Ready-to-use waterless, non-ammoniated clock cleaning solution formulated to be used with L&R Clock Lube. This product can now be shipped as a OMR-D item, it can only be shipped by UPS ground in the contiguous 48 States. If you order this product your order will be shipped by UPS ground service. Ultrasonic Lubricant and Rinsing Solution. A complete clock lubricating and rinsing solution. 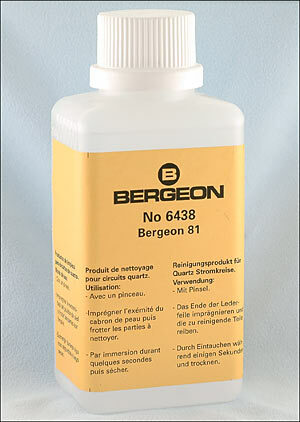 Use with L&R 677 Clock Cleaning Solution. This product can now be shipped as a OMR-D item, it can only be shipped by UPS ground in the contiguous 48 States. If you order this product your order will be shipped by UPS ground service. Formula 67 dissolves hardened grease, dirt, and oils at the same time the active ingredients and additives break the bond between the crust and the metal part. 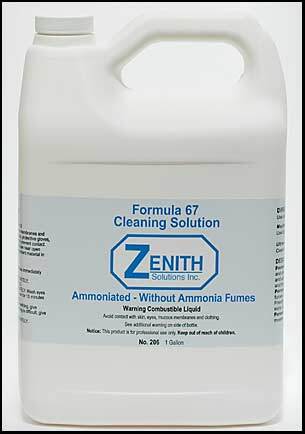 Formula 67 is ammoniated but without the ammonia fumes, containing safe and environmentally friendly chemicals that give the cleaners that extra cleaning power. Formula 67 restores watch and clock movements to their original shine and luster. This product can now be shipped as a OMR-D item, it can only be shipped by UPS ground in the contiguous 48 States. If you order this product your order will be shipped by UPS ground service. 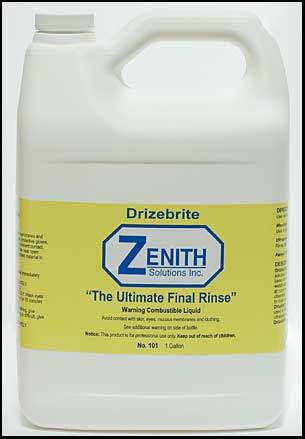 Drizebrite is formulated to be used as a rinsing solution after metal parts are cleaned in solvent base cleaners. Drizebrite is designed to leave watch and clock parts spotless without any oily film at room temperature or when dried in a heating chamber. Drizebrite restores delicate movements to their original luster. As an added feature, Drizebrite is rated odorless. Drizebrite can be used in old or modern cleaning machines, including ultrasonic machines. Thanks to Modern Chemistry Drizebrite is "The Ultimate Final Rinse." 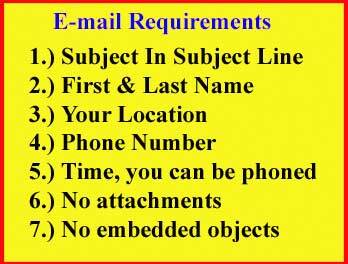 This product can now be shipped as a OMR-D item, it can only be shipped by UPS ground in the contiguous 48 States. If you order this product your order will be shipped by UPS ground service. Radiant Cleaner is "The Ultimate Watch and Clock Cleaner" because it makes parts clean and shiny at the same time. Radiant is rated as a high performance cleaner and is in a class of its own. After the cleaning the cycle, metal parts sparkle. 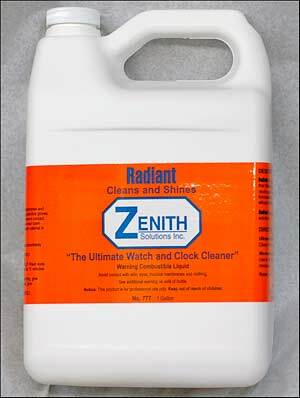 The concept of cleaning and having parts shine simultaneously took Zenith's chemists seven years to develop. Thanks to their knowledge of cleaning technology and experimentations, they arrived at the formula for Radiant. This product can now be shipped as a OMR-D item, it can only be shipped by UPS ground in the contiguous 48 States. If you order this product your order will be shipped by UPS ground service. 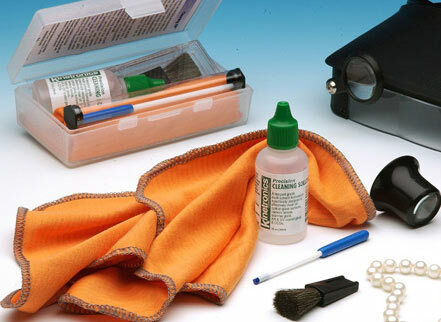 Unique tools for removing dust, lint and specks from Watch Dials and Crystals, Loupes, Mocroscope Lenses, Cameras and Jewelry. 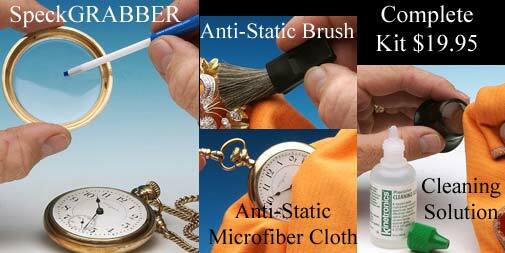 You get the SpeckGRABBER to pick up tiny particles from sensitve surfaces without leaving any residue, Anti-Static Cloth with tiny pockets in the Mircofiber to capture minute dust and dirt particles, Anti-Static Brush for hard to reach places and wisking dust away, Precision Cleaning Solution for use on optics, plastics, glass and jewelry. Everything you need packed in a durable storage box. Everything you need to do the job right! This is a 2 ounce bottle. The U.S. Department of Transportaion has classified this product as a OMR-D item and it can only be shipped by UPS ground in the contiguous 48 States. If you order this product your order will be shipped by UPS ground service. This is a one half-pint bottle (8oz). The U.S. Department of Transportaion has classified this product as a OMR-D item and it can only be shipped by UPS ground in the contiguous 48 States. If you order this product your order will be shipped by UPS ground service. This is a one quart can (32oz). The U.S. Department of Transportaion has classified this product as a OMR-D item and it can only be shipped by UPS ground in the contiguous 48 States. If you order this product your order will be shipped by UPS ground service. Bottle of 50 gram. Soak movement with rust remover for two minutes; then rinse with water and dry immediately. For small parts, wet the tip of a pegwood with the formula and rub the spot of rust; rinse and dry accordingly. Never dry the movement without having rinsed it. 250cc bottle. You can use the solution with a brush or dip the end of a leather buff in liquid and clean the parts that needs to be cleaned. You can also dip the part in the solution for a few seconds and then drying. 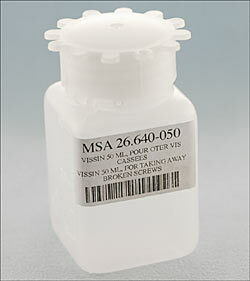 This uniquely designed plastic jar is made for immersing and coating delicate parts to ensure total coating protection. 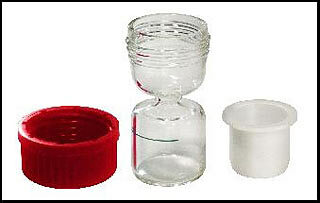 Used in conjunction with a parts cleaning basket (sold separately), to keep small parts from falling into the bottom chamber. For use with Moebius-Fixodrop Epilame No 8940, 8941, 8950, 8951. Specially designed glass bottle for Epilame. For use with Moebius-Fixodrop No 8940, 8941, 8950, 8951. Comes with bottle, cap, and basket. 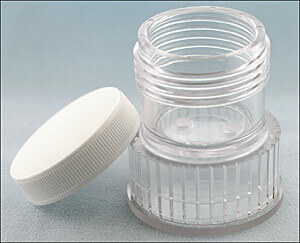 Place in Jars #2 & #3 in your cleaning machine, use instead of regular rinse. This product can now be shipped as a OMR-D item, it can only be shipped by UPS ground in the contiguous 48 States. If you order this product your order will be shipped by UPS ground service. This item has been discontinued and no longer available. Use in Jar #3. Solo-Lube is a single step lubricant similar in application to Duo-Lube but used in the last rinse jar only. Thoroughly tested and proven for efficiency and uniformity. 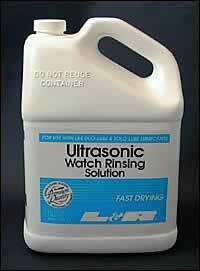 L&R Solo-Lube is blended with L&R Ultrasonic Watch Rinsing Solution. 1 Gal. Pre-mixed. This product can now be shipped as a OMR-D item, it can only be shipped by UPS ground in the contiguous 48 States. If you order this product your order will be shipped by UPS ground service.